Knowing the ethical thing to do and actually doing it can be very difficult. A brief review of the InFRE Code of Ethics will be followed by examples, case studies and discussion to explore the practical side of ethical decision making. Mary is a benefit plan consultant in Oregon, Wisconsin with more than twenty years experience in the field of public employee retirement benefits. Prior to starting her consulting business in 2002, Mary was Director of the Office of Supplemental Retirement Plans and Federal Compliance for the State of Wisconsin Retirement System and was responsible for the Wisconsin Deferred Compensation Plan, an unbundled Section 457 plan. Mary was the 2001/2002 President of the National Association of Government Defined Contribution Administrators (NAGDCA) and has been involved with the International Foundation for Retirement Education (InFRE) since its inception in 1997. She serves on the InFRE Board of Standards and holds both the Certified Retirement AdministratorSM (CRA) and Certified Retirement Counselor (CRC) designations. Mary is an expert in public sector retirement plans, specializing in Section 457, 403(b) and 401(a) defined contribution plans. She has co-authored and updated textbooks used in the coursework for the CRA designation and authored many articles for various newsletters and industry publications on topics pertaining to retirement plan issues. She is also a frequent speaker at industry conferences. 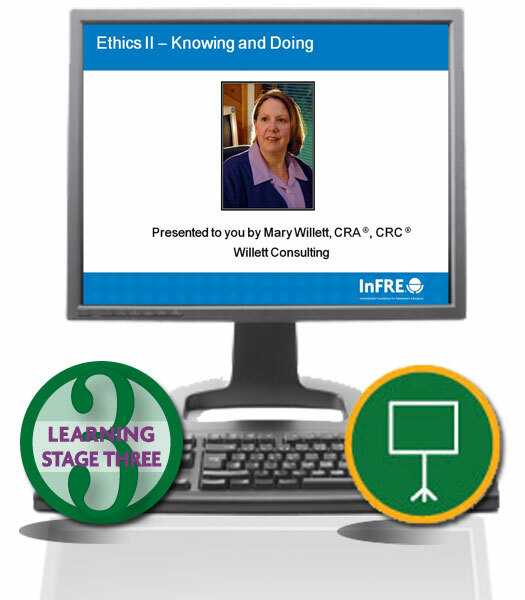 After passing exam, reporting to InFRE for CRC® CE credit is free. Your satisfaction guaranteed: We know that you will be pleased with your purchase of this product. If, however, you are not completely satisfied notify us within 30 days of your purchase to receive a full refund of your fee.